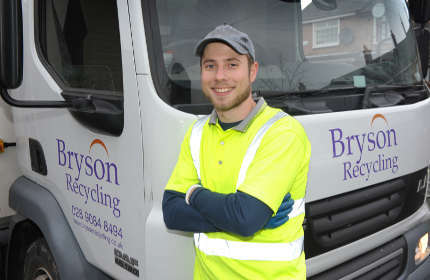 Bryson Recycling is committed to taking your privacy very seriously and protecting and respecting your information. We aim to be clear about how we use your personal information and this Privacy Notice will inform you about how we look after your information, what information we process, the reasons why we process your information and the conditions under which we may disclose it to others. It includes the relevant requirements of the General Data Protection Regulation which came into being on the 25th May 2018. 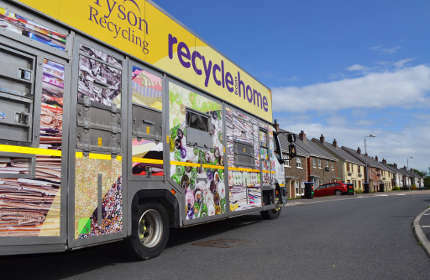 Bryson Recycling is a company registered in Northern Ireland, registration number NI611592 and registered address: Belfast Road, Central Park, Mallusk, BT36 4FS. Bryson Recycling is a trading subsidiary company and is part of the Bryson Charitable Group. 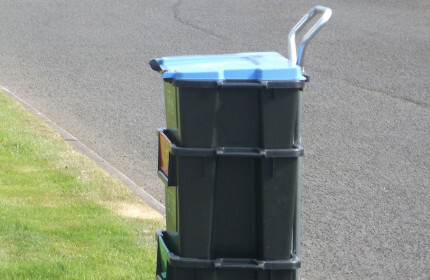 We deliver a range of recycling services across Northern Ireland, Co. Donegal and Wales including; a kerbside collection service to over 170,000 households in Northern Ireland, a Materials Recovery Facility (MRF), a commercial recycling collection service to schools and businesses and operate 8 Recycling Centres. Any information that we collect from you is necessary for the delivery of our services. The legal basis for processing is based on legitimate interest in relation to the provision and management of the services and the necessity to meet the contractual requirements set out by the funding bodies that purchase the services from Bryson Recycling. It will also be based on the requirement to comply with any legal obligations, to defend any legal claims and for archiving purposes. It is essential that relevant information is collected about you so that we can provide you with the best possible service to meet your needs. In order to do this we need to collect a number of categories of personal data through a number of channels including (face to face, by telephone and email). We may collect your personal data by CCTV which is in place on all our sites and fitted on vehicles which are used for kerbside collections. The required notices are in place to inform customers on our sites and the general public who may be in the vicinity of the kerbside vehicle that CCTV is in operation. The personal information that we collect in relation to our commercial customers include; company name, contact name within the business, address, contact number, email address. In relation to kerbside customers we do not store any personal information except if there has been a complaint or enquiry made which will involve collecting the name, address, contact number and details of the complaint or enquiry. Images collected by CCTV as described above are defined as personal data under data protection legislation. To set up and administer the service; as well as managing your customer journey and contact. To respond to queries, to manage and investigate any complaints or enquiries in relation to the service you are receiving. From time to time we may provide you with information on any new services we provide which we feel may be of interest to you. In order to improve our services and customer interaction we will carry out customer surveys. To produce outcome analysis reports to assess the impact of the services. To produce statistical reports made publicly available in some cases. CCTV is used for security and health and safety. Like most websites, we gather statistical and other analytical information of all visitors to our website including cookies.We use the data gathered to get a better understanding of where our visitors come from and to help us better design and organise our website. We will only share your personal information with stakeholders who are part of the delivery, monitoring and funding of the service and the information will only be used for the purposes discussed in this policy. These are primarily the Councils that fund our services other contractors or suppliers operating on our behalf. We have a variety of methods for sharing information e.g. telephone, emails and reports. We review our retention periods for personal information on a regular basis. We will hold your personal information on our systems in line with contractual requirements, legal requirements or international standards including ISO9001. For our commercial services we will only keep your personal information for as long as the service is being provided to you. Once the retention periods have been reached or we no longer need to process your information we will dispose of it through secure means which are approved under data protection legislation. We ensure that there are appropriate technical and organisational controls in place to protect against unauthorised or unlawful processing and against accidental loss, destruction or damage. Information is retained in secure electronic systems and paper records in secure filing cabinets and access is restricted to only those who need to know. Right of access: You have a right to ask for a copy of the information that we hold about you this is known as a Subject Access Request. We will have 30 days to respond to your request. Please contact Ken Ewing on 028 9084 8484 or Shauneen Killyleagh on 028 90325835 to exercise this right. Right to rectification: You have the right to have personal data corrected. The accuracy of your information is important to us. We would really appreciate if you let us know if your contact details change or if any other pieces of information that we hold on you is inaccurate. Right to erasure: You have the right to have personal data erased in certain circumstances. For example if information is not being used for its original purpose. Right to restrict processing: You have a right to ask us to stop processing your personal data, if for example the information is inaccurate or if we are processing the information unlawfully. Right to transfer: You have a right to ask for your personal information to be given to you directly or a third party. Right to object to processing: You have the option not to agree to the processing of your personal data if you feel it is impacting on your rights as an individual. We will stop processing your personal data unless we can demonstrate compelling legitimate grounds for the processing which overrides your interests, rights and freedoms or where the processing is necessary for the establishment, exercise or defence of legal claims. Right to complain: If you wish to make a complaint on how we have handled your personal data, you can contact Ken Ewing on 028 9084 8484 or Shauneen Killyleagh on 028 9032 5835. If you are not satisfied with our response or believe we are not processing your information in accordance with the law, you can contact the Information Commissioners Office, details provided below. Please note: If there are serious concerns relating to your well-being or that of another person we may in exceptional circumstances, share information without your agreement, this can include anything with reference to preventing and / or detecting a crime.